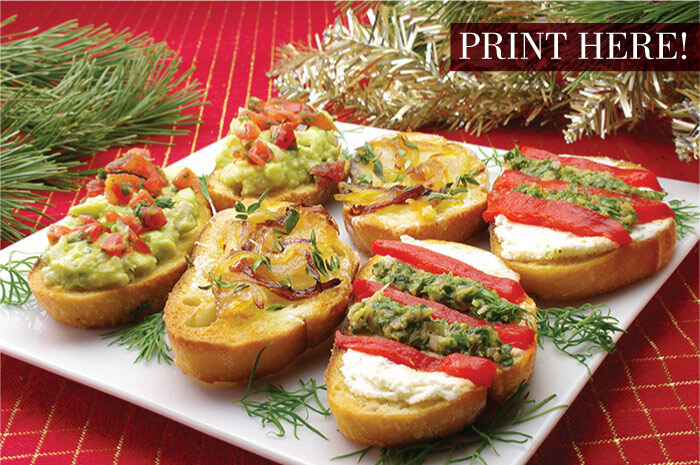 A wonderfully topped crostini is just the small bite to enjoy as the party starts! Toast slices of baguette quickly so that the outside is a nice golden brown but the inside is still fresh and not dried out. Top with one of the three toppings below and you will have a happy crowd! 1. Cut and seed the avocado. Remove the avocado flesh from the skin and smash to a chunky consistency in a small bowl with the lime juice, shallot, cumin, and salt. Set aside. 2. Dice the tomatoes, seeding and draining juices away. 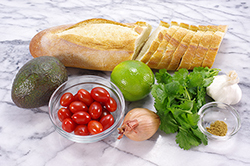 Toss the cilantro with the diced tomatoes. 4. 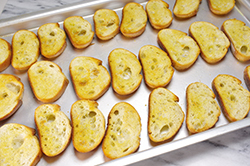 When just cool enough to handle, rub a peeled clove of garlic on one side of the toasted crostini. 5. 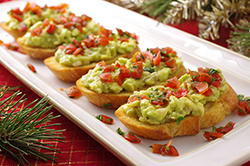 Top the crostini by smearing a spoonful of the avocado mix on each slice, top with a spoonful of the tomatoes and cilantro, and serve. 1. 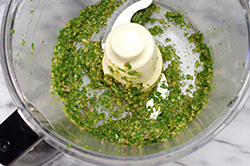 To make the chimichurri, place the parsley, garlic, olive oil, white wine vinegar, shallot, oregano, pepper, salt, and cayenne in the workbowl of a food processor. 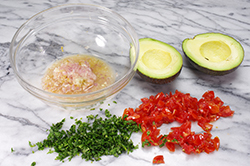 Pulse until the mixture is evenly and finely chopped; scrape down the sides frequently. 2. Prepare the roasted red peppers draining well. Cut 1/4-inch strips. Pat dry if necessary. 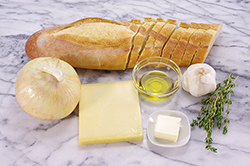 Set aside until time to assemble the crostini. 5. 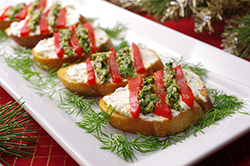 Top the crostini with a thin layer of the herbed Boursin cheese. 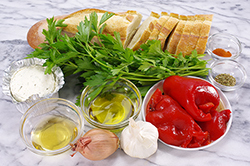 Place three strips of red pepper across each slice in a diagonal fashion. 6. Drizzle stripes of the chimichurri between the red pepper strips. Serve. 1. 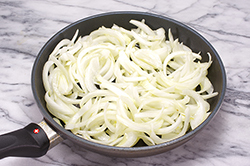 Slice the onion in half, then each half into half moon slices about 1/8-inch thick. 5. Top the each slice with shredded Gruyère and return to the oven. 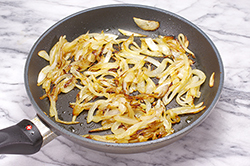 Remove once the cheese has melted but not browned. 6. 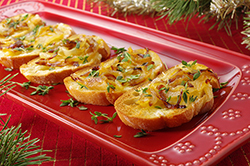 Spread a spoonful of the caramelized onions on each crostini. Sprinkle with the fresh thyme leaves, and serve.